'You'd sing too/ if you found yourself/ in a place like this. /You wouldn't worry about/ whether you were as good/ as Ray Charles or Edith Piaf." Those lines, from Leonard Cohen's You'd Sing Too are delivered by Aimee Richardson, standing in the floodlights of the Smock Alley Theatre: "You'd sing/ not for yourself/ but to make a self," she says. This is the opening scene of Showstoppers, a documentary filmed over a year, about the work of the Blue Diamond drama academy, which works with adults with intellectual disabilities, to create third level education and employment through the arts. 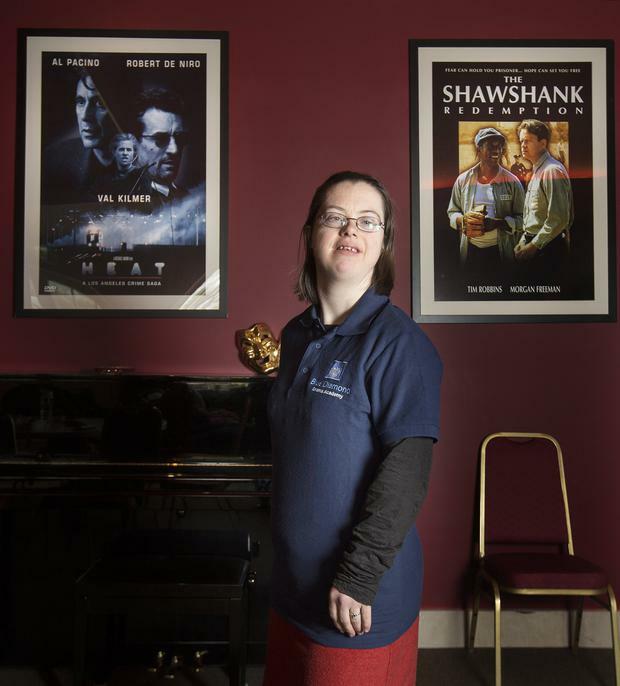 "If we can include adults with intellectual disabilities on our film and TV screens and national stages, we hope to change societal perceptions and increase the offers for young adults," says Kate Sheridan, CEO of Blue Diamond. Showstoppers follows the first intake of students - there are now 52 on the course - who graduated last November, as they prepare a play, One Love, work-shopped by themselves with Kate and artistic director Niamh Dillon, based around Romeo and Juliet. They also prepare show-reels for casting directors, one of whom has flown in from the UK to see their work. "It's really important we start bringing people in for all roles," she says. "A lot of these actors could play any role." The film is co-directed by Aimee, who also stars, alongside the other members of the group (she is also a talented musician). Aimee has Down syndrome, of which she says: "It doesn't get in the way at all. Down syndrome is like another type of travel pass that gets me through life, from one thing to another. It leads me to great opportunities." Showstoppers is that rare thing - a film made by its subjects as much as about them. The difference is subtle, but instantly noticeable; there is a close and collaborative dynamic. Much of this has to do with Aimee, who is articulate, bright, energetic and empathetic. Aimee (37) has "always" been interested in acting. "I did a few plays when I was younger," she says. "I've always loved performing. Not only do I act, I play a lot of Irish music. That gives me confidence on stage. And when I'm on stage, I'm in a world of acting, a world cut-off from the rest of the world." The first step in joining Blue Diamond is an audition - Aimee did Shakespeare's Sonnet 18, Shall I compare thee to a summer's day? "I delivered it really well," she says. "And then I got a call saying 'you got through!' I like the idea of a theatre company with actors of mixed abilities, because it gives people a chance to perform and show their abilities, and show that we are like any other actor. This is an example of what we can do." The themes of One Love are intensely personal; they are also highly political. Not only are these actors talking about their own experiences of love and romance, they are also tackling a broader societal issue. It is only three years since the unpleasantly-named Lunacy Act was repealed. This prevented those with intellectual disabilities and mental health issues from making crucial decisions around issues such as their own care and futures, including marriage and relationships. That power belonged, instead, to the State, as these adults were wards of court. That is no longer the case, and in Showstoppers, we meet Deborah Bolton who says, "I would like to get married. I see my mum and dad. They were really happy, they had kids. I would actually love that experience." Lisa Cox talks about "a difficult experience with a good friend; he tried to control my life". We also meet Tara Mooney, who is engaged to John and tells him "your smile is perfect". Later, she talks to her mother, Teresa, about her relationship. "Would you like to have a place with just you and John?" her mother asks. "No," Tara says, "I want to stick with you." It's life. It's love. It's complicated. The group discusses work and the right to be paid. "I think it's great when people with disabilities get jobs," says Aimee. "Sometimes they have this old-fashioned idea that people with disabilities are worthless. I know for a fact that's not true." Daniel Ryan, who rightly says "I'm a natural when it comes to cameras," also talks about wanting a job "so you can earn a few bob." Because this is very much the point of Blue Diamond. That those involved will graduate to careers and paid employment within the industry they have chosen. There are moments of conflict - what play ever reached a stage without there being moments of conflict? - but these are resolved with open conversation and respectful consideration given to everyone's views. There are also scenes in which one person stands in the middle of a group, hands over her ears, while the group circles her and calls out a cacophony of phrases: "What is wrong with you?" goes one; "You have to hurry up!" goes another. The voices are loud and insistent, the person in the middle is bewildered and vulnerable. It's a hard scene to watch. Because it, like everything else in the play, is based in lived experience. "What I have found is that devising work supports people to be their best," says artistic director Niamh Dillon. "Particularly people who might struggle with literacy or learning lines. Creating an authentic story that relates to their own experience. There aren't," she points out, "that many stories or plays out there about people with learning difficulties. As a theatre maker, it's important to reflect people in an interesting way, draw on their own experiences of their own lives." Applications have been put in for One Love to be staged at the Fringe Festival and as part of Galway City of Culture. "Our graduates are being cast in professional roles. Only this morning," Niamh says, "one of our graduates was cast in a UK-based film." In fact, she says, "the challenge is that we've got off to a really fast start. Now, it's about us being sustainable. We still don't have long-term sustainable funding". That, she says, is the challenge, rather than anything internal. "The people we work with are extraordinary," she says, "they don't block, nothing is a problem, they are 100pc committed, and that energises all of us. "I hope anyone who watches this would be inspired. For parents, aunts, brothers, sisters, of anyone with an intellectual disability, that they would dream big dreams for that person."